Players like bassist-composer Pascal Niggenkemper exemplify the fact that, while there is undeniably a New York jazz scene, creative music in the boroughs is about so much more than just geography. While he now calls Paris home, Niggenkemper, who is of French-German descent and studied music in Köln, was active in a variety of New York-centric ensembles including drummer Gerald Cleaver’s Black Host and fellow expat Joe Hertenstein’s HNH (with trumpeter and cornetist Thomas Heberer), as well as work with pianist and instrument-maker Cooper-Moore, percussionist Tatsuya Nakatani, and the bass duo PascAli with Sean Ali. While Niggenkemper is a player with a rich tone, impeccable time and a desire to play with a range of other musicians (and their idiosyncratic approaches), his desire to explore what could be done with the bass necessitated a variety of preparations and extended techniques, all quite visually arresting as much as they upped the sonic ante. These have included utilizing styrofoam, metal lampshades and inserting bows into the strings, allowing for an expansion of tonal resources as well as percussive ones. 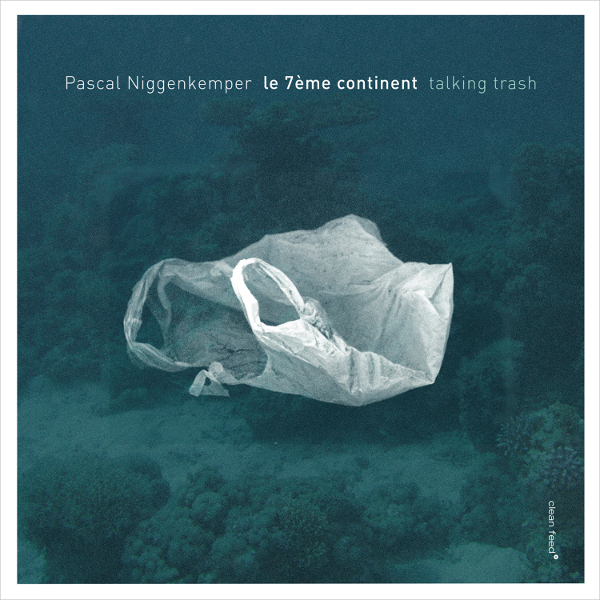 Talking Trash is Niggenkemper’s latest disc for Clean Feed and the first to feature Le 7ème Continent, an ensemble joining him with three woodwind players and two pianists across nine original works. Flutist Julián Elvira and clarinetists Joris Rühl and Joachim Badenhorst are heard (the latter two amplified) alongside pianists Eve Risser and Philip Zoubek, both of whom utilize extensive preparations, and on one piece Niggenkemper is augmented by bassist Constantin Herzog. The musicians come from Germany, Austria, France, Belgium and Spain, though individual voices are subsumed slightly under the weight of drummerless tonal push and suspended in levitating abstraction. The disc’s title refers to a giant island of floating garbage in the Pacific Ocean — sadly appropriate as the world’s oceans are in rapid environmental decline. Following the clanging overture of “Great Pacific Garbage Patch,” the ensemble moves through erudite glisses on “135ºW — 155ºW & 35ºN — 42ºN,” clarinet purrs and sub-contrabass flute daubs in a sharpened drift against gestured keyboard sizzles, an airy precision that congeals in the knocks, patter and galumph of “Gyres Océaniques” and its apposite dances. Though the high-pitched natter of bowed styrofoam and sure pluck occasionally pierce through the ensemble, the leader’s strategies for directing improvisers are the focal point rather than his instrumental voice, coaxing otherworldly rustle and amplified drones from closely-valued hues and strange shapes, occasionally alighting on folksy melodic twirls. Certainly the whole relates to Niggenkemper’s sound-world as more than low-swinging strings, but he wouldn’t likely have gotten here without the tug of metal, wood, guts and horsehair. And perhaps, as with organist Larry Young and Nixon’s White House, Niggenkemper and company will redirect their subject to a better place.